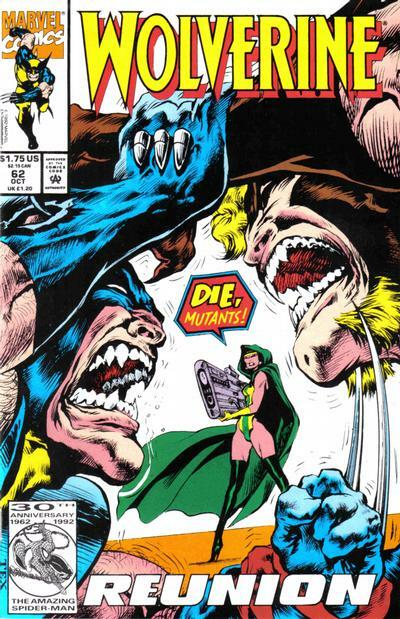 Wolverine comes face-to-face with the very-much alive Silver Fox for the first time this issue. Hines, the last living member of the Professor/Dr. 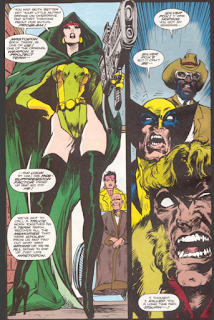 Cornelius/Hines trifecta from "Weapon X" turns up this issue, having been found by Silver Fox in Minneapolis (and, speaking as someone who lives in suburban Minneapolis, I'm not sure why finding here in that city is so notable...). 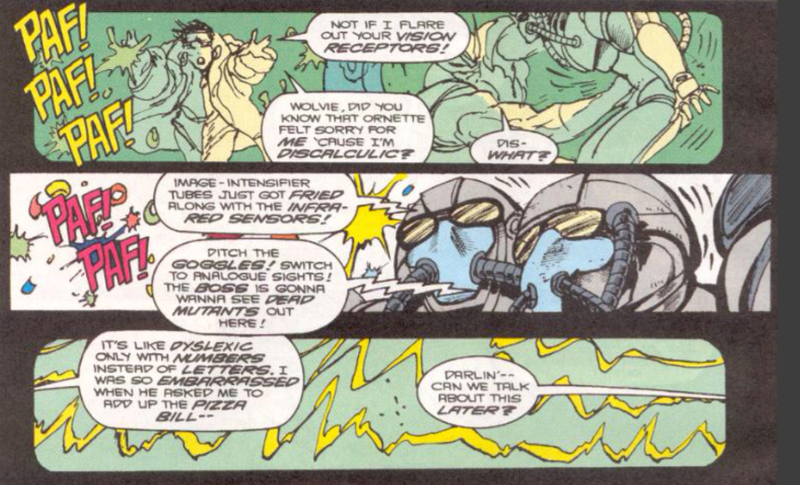 Jubilee, somewhat randomly, discovers she's discalculic (ie like dyslexia, but with numbers), but I don't think this ever gets brought up again (this is certainly the first time I've heard mention of it). This is the first appearance of Aldo Ferro, who is listed alongside the other Weapon X project architects and is said to have been a major crime boss back in the 50s and 60s. Like the rest of the Weapon X participants, he remains young and vital. 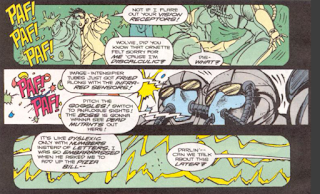 Maverick pops up at the very end of the issue, his first present-day appearance in the series, as Ferro's bodyguard. Mastodon dies this issue, reduced to a puddle of goo due to the failure of the Weapon X age-retardant. 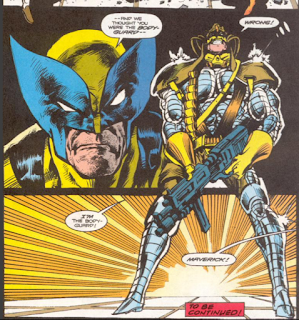 Two more Weapon X members, code-named Wildcat and Vole, are referenced, but nobody knows who they are. 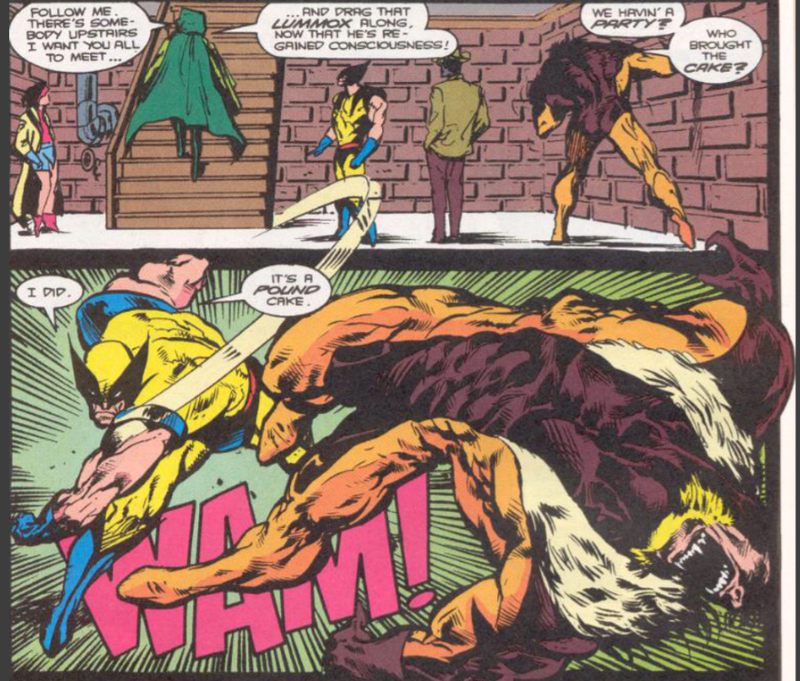 Wolverine says they should wall up Sabretooth with a cask of Amontillado, a surprisingly-literary reference to the Edgar Allan Poe story of the same name. When Sabretooth asks "who brought the cake?" Wolverine responds with "I did, it's a pound cake!" before punching him. 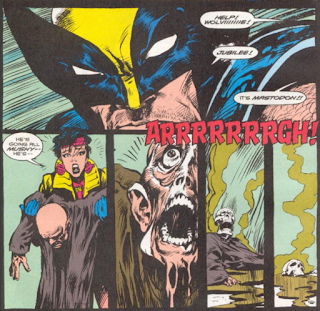 Mark Texeira's art helps keep things energetic, but otherwise, this is kind of a mess. 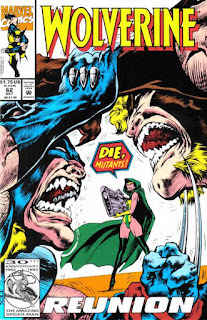 It's very repetitive, with lots of characters standing around talking before Wolverine & Sabretooth lose control and fight each other, then more talking, before their next outburst of fighting, over and over. 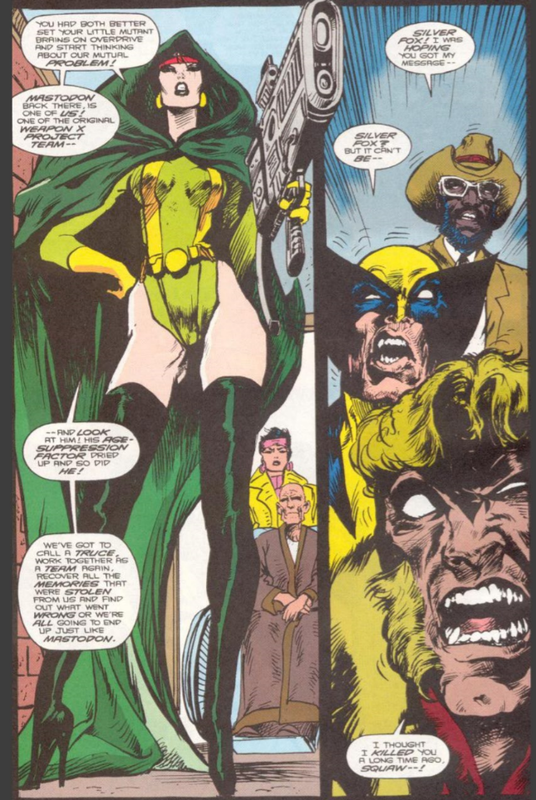 Silver Fox even makes a point of saying they all need to put aside their differences and work together...just before blasting Sabretooth herself out of spite. 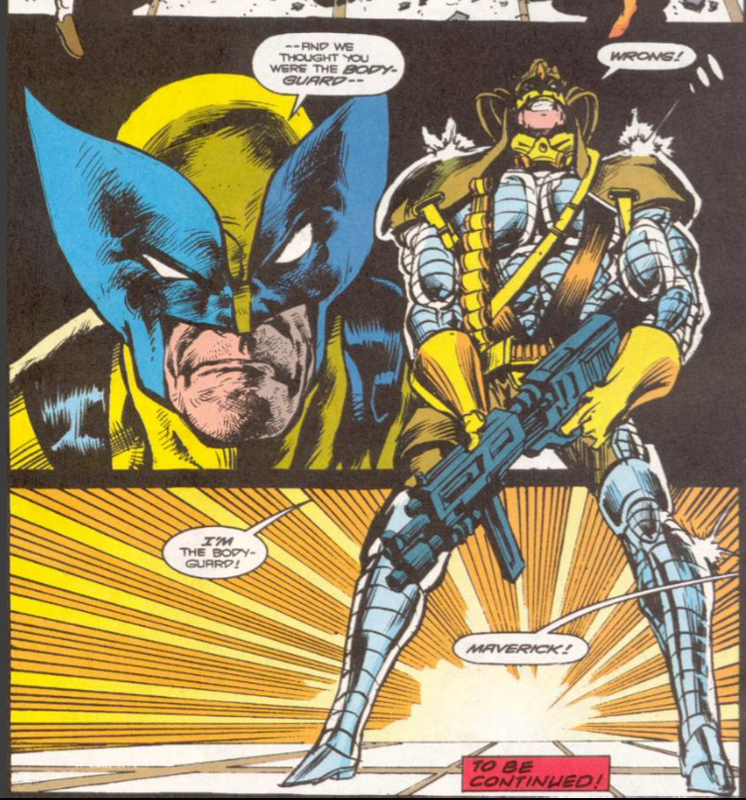 Technically, the plot moves forward: more Weapon X members get recruited into Wraith's quest, and the team tracks down Ferro and, in the process, bumps into Maverick. But it's a rather boring and noisy journey along the way. Next week, Captain America #402-#408: Cap-Wolf! I like this one plenty for some reason. 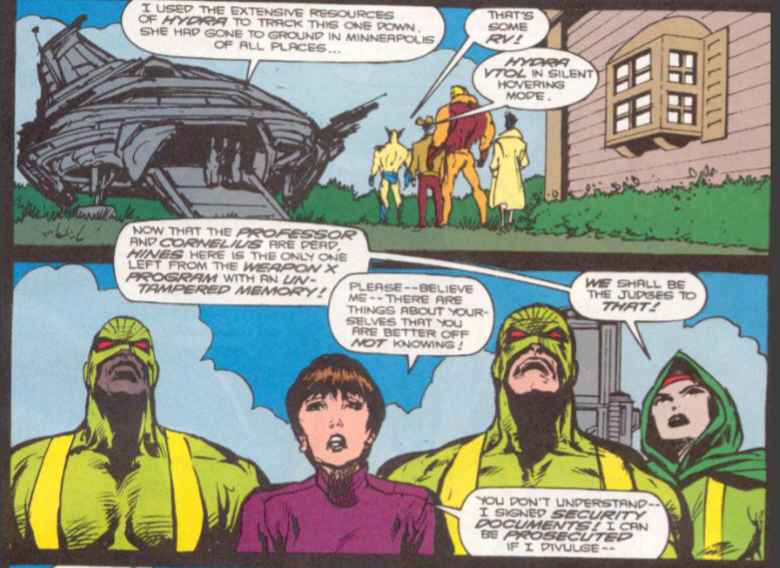 Ornette totally steals the show with having cojones to tell off everyone in the Weapon X team when they cross his lines. 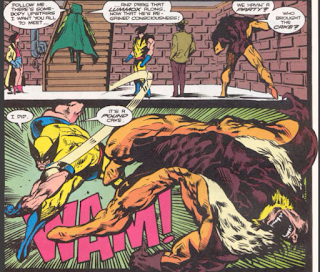 @Austin: Jubilee's dyslexia is later brought up by Lobdell in Generation X, IIRC (when Beast is over supervising an exam). @Austin: Ferro wasn't remaining that young and vital, given his receding hairline! 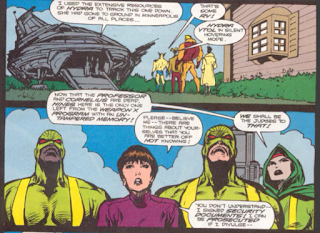 As for Maverick, we have him working for West Germany and the "Major" in previous X-Men issues, and now for a crime-lord!? So that’s apparently something afforded by the program, but Wolverine’s healing factor would have done the same for him anyway. I'm saying but I guess I'm asking too. Maybe that's part of his out in avoiding Mastodon's fate. Pun with Larry: quite possibly the plane crash-in is there mainly so Hama can do his 'auger in' pun.